Stockholm is a royal city with lots of historic charm. With its fantastic location, where Lake Mälaren meets the Baltic sea. the city is situated on no less than fourteen islands, all connected to each other by more than 60 bridges. Because of all the waterways Stockholm is sometimes called the “Nordic Venice” and we mean that Venice should be very happy to be compared with this capital of Sweden. 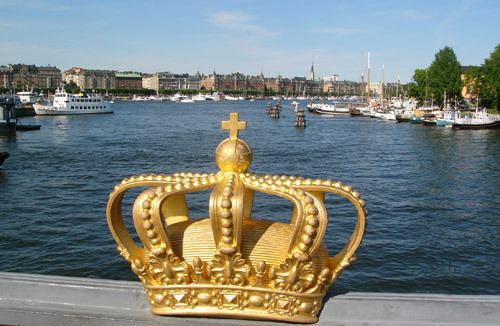 In Stockholm you also find the Royal Palace (Kungliga Slottet) – the home of Swedish Royalties for hundreds of years. Today lives the Swedish King Carl XVI Gustaf and his Queen Sylvia in Drottningholm Palace outside Stockholm; the Royal Palace is a official residence of the king and the place where he works. Stockholm is blessed with an endless amount of clear and clean water, you can swim and even fish in the middle of the city. Stockholm is also a city of contrasts. A charming old town and magnificent buildings stand alongside green oases. The city pulsates with cutting-edge culture and life, despite the centuries-old alleys and historic squares around almost every corner.